Discover the premium amenities and superb service at Santa Clara Marriott. Our upscale hotel is only minutes from the Santa Clara Convention Center, as well as attractions like the Intel Museum, California Great America and the home of the 49ers, Levi's Stadium. Relax inside spacious rooms which benefit from courtyard views and walkout balconies. Every room or suite offers pillowtop mattresses, flat-panel TVs, ample desks and Wi-Fi access. Concierge-level rooms grant access to exclusive lounge perks, and our suites provide generous layouts for unwinding with family or entertaining. Take advantage of our modern fitness center, tennis courts and resort-like outdoor pool. Fine and casual dining is available on-site, including the award-winning Parcel 104, designed by celebrity Chef Bradley Ogden. The hotel also boasts more than 29,000 square feet of sophisticated indoor and outdoor space, ideal for lavish weddings, conventions or more intimate events. 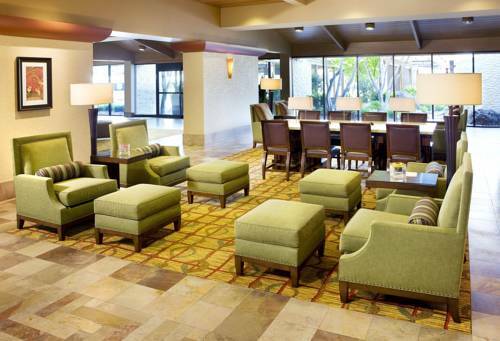 We look forward to your visit to Santa Clara Marriott. Parcel 104: Celebrity Chef Bradley Ogden has created a farm-to-table gem at Parcel 104. This award-winning restaurant, in Santa Clara Marriott, features innovative cuisine using the freshest, seasonal ingredients produced by local growers. Every bite will delight. Bosc + Bartlett (New): Local flavor abounds at Bosc + Bartlett. Savor a local craft beer or glass of Napa wine as you peruse a menu of California Eclectic dishes and shareable small bites, all in an energetic environment with Santa Clara flair. Starbucks : Begin your day in Santa Clara with a rich coffee or specialty drink at our hotel's Starbucks . Relax and check your email over freshly baked pastries or other satisfying snacks before meetings or sightseeing.